It is an easy-to-follow, two-level course that includes all the tools a student needs to achieve a firm command of Latin. It meets existing foreign language requirements for high school graduation. The course was carefully crafted and refined to suit the needs and abilities of a broad spectrum of students. 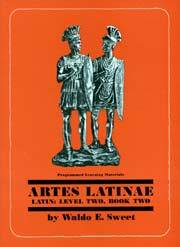 Students from ages nine through adult have learned Latin through Artes Latinae. Book Two includes programmed texts and exercises for Units 13-24. Book One includes programmed texts and exercises for Units 1-12, click the Related Titles link for information on Book One.